While coal might still be the first source of energy for electricity generation in the world, the tides may be turning in two of its largest markets, the People’s Republic of China and the United States of America. Several facts are pointing to that conclusion.While China consumes now as much of the black dirty stuff than all other countries combined I noted in a previous article that coal consumption could peak there soon. This was backed by several factors as well as a study from a prestigious bank.Some analysts believe that this may take place as early as 2015. 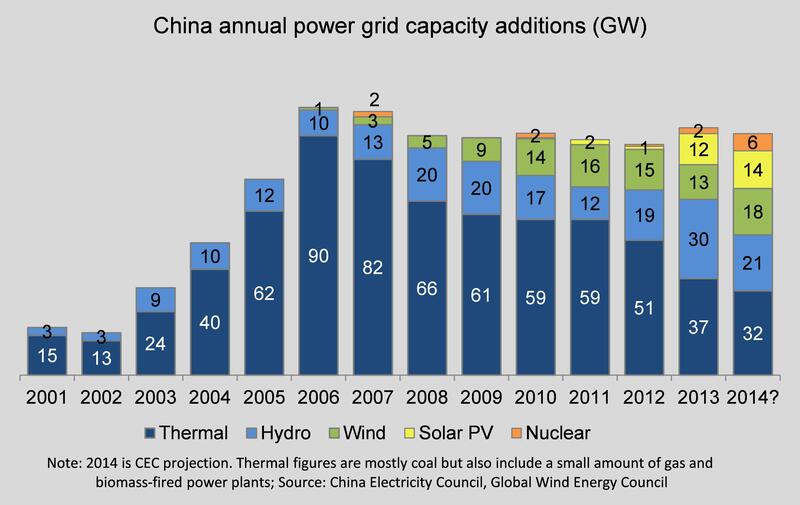 The country is currently installing 150,000 solar panels each single day and there is little doubt that the upcoming carbon tax next year will be another nail in the coffin of King Coal in China. In the United States, nearly a quarter of coal-fired plants could be taken offline by 2020 as a result of new environmental regulations and the decreasing competitiveness of the dirtiest fossil fuel. The share of coal in the US electricity mix has already been decreasing from above 50 percent to less than 40 in recent years. As renewable energy sources are getting cheaper and cheaper, they are also creating more and more jobs. Up to 600,000 people are working in the sector in the United States as the NRDC reports. These are extremely encouraging trends for China, The United States and the entire world. I will keep you updated of further developments as well as if it is the case in other regions of the world.